Thai prosecutors have formally charged labor activist Somyot Pruksakasemsuk with lese majeste after a magazine he edited carried two articles that allegedly insulted the nation’s king. Somyot, who is a former Thailand YCW fulltimer, was charged after he had been already imprisoned for 84 days, the maximum number of days that a prisoner can be held without charge under Thai law, the Bangkok Post reports. Somyot told the paper that the incoming government to be led by Yingluck Shinawatra seemed content to work under existing draconian legal and social settings. “We all hope that civil liberty will be cherished and will prosper, as it must be the highest priority of society along with reconciliation. “To reconcile does not mean just between Thaksin and the elite, but also mutual understanding and tolerance between various groups in society. “Reconciliation must reach-out to the victims and the damaged parties and must include humane and adequate remedial procedures for those injured and affected by last year’s crackdown,” Somyot said. In a statement, Cardijn Community International president Stefan Gigacz called for Somyot’s release and for the dropping of charges. “Whether of not we agree with Somyot’s political options, it is time for Thailand to heal the divisions of recent years. 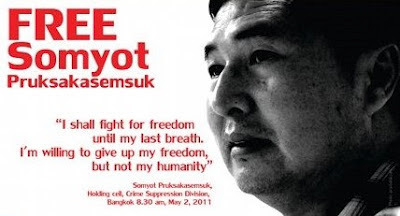 “Somyot has worked tirelessly for the benefit of Thai workers for many years. It is deeply regrettable that he should now face many years in jail for his commitment,” Mr Gigacz said.